Gorgeous cover; the photograph was taken by the author. And this book has some of the best endpapers I’ve ever seen. When Helen MacDonald says a book is “bloody marvelous,” you can bet whatever you like that I will read that book, and you will come out a winner. Angered by the contempt shown his parents’ and grandparents’ occupation in school—he is fervent about his secondary education’s uselessness—Mr. Rebanks only later continued his formal education (at Oxford, no less; clearly his teachers missed an opportunity to reach a bright student). But by the time he reached his twenties he’d been educated in farm life for more than a decade. His family farm raises sheep. “We are a tiny part,” he writes, “of an ancient farming system and way of life that has somehow survived in these mountains because of their historic poverty, relative isolation, and because it was protected from change by the early conservation movement” (23). 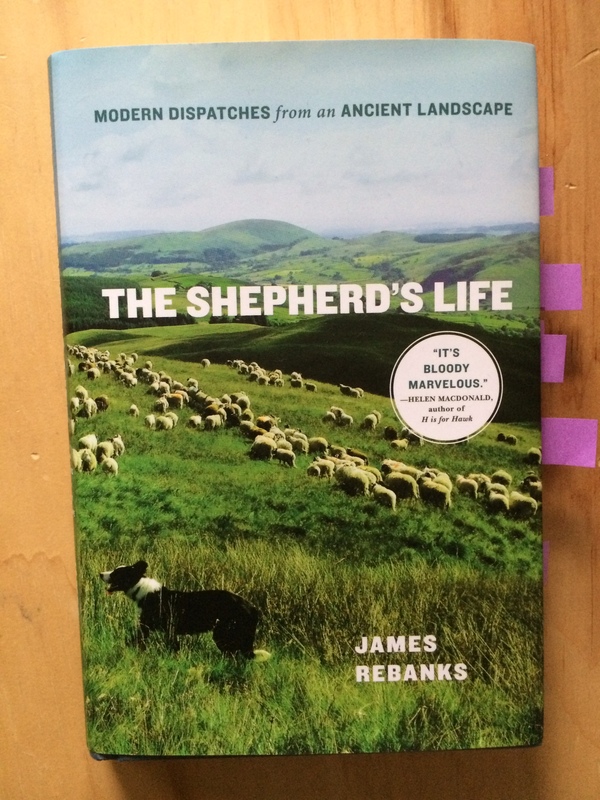 The Shepherd’s Life is split into four parts that correspond with the seasons; each part is composed of short sections on shepherding practices, geography, Mr. Rebanks’s grandfather’s life, and Mr. Rebanks’s own life’s trajectory, all of which are sometimes intertwined. The sections that deal heavily with shepherding practices are the most successful and interesting in the book. For example, Mr. Rebanks shows in vivid detail what it’s like to herd sheep in craggy fells, how important a good sheep dog is (they aren’t pets, though very deeply valued), and just how brutal the long days of lambing season are. In his world, “things are driven by the seasons and necessity, not by our will” (32). In these pages, Mr. Rebanks makes the passionate and persuasive case that traditional farming is a way of life that is worthy of respect, and worth preserving. However, while there is a great deal of material in the book to help readers appreciate the very hard work that he and his family do (and that this work is not particularly remunerative; many farmers have second or third jobs to make ends meet), I didn’t feel there were enough concrete prescriptions for how to go about supporting it in practice. The Shepherd’s Life is a book for those who want to immerse themselves in another kind of life, one that we might think has already vanished or that is so grindingly hard that people must want to escape it. To the contrary; Mr. Rebanks rails against what he perceives to be the degradations of the modern world, which doesn’t leave people much choice about how they live and work (which might sound odd coming from a shepherd whose family has worked the land for generations, but, given Mr. Rebanks’s biography, makes sense). During a summer in London, he thinks, “it’s like the gods are showing me how tough everyone else’s lives are and what I have left behind. I understand for the first time why people want to escape to places like where I live. I understand what national parks are for, so that people whose lives are always like this can escape and feel the wind in their hair and the sun on their faces” (179). Despite this sentiment, he also chides the conservation movement, which, despite its acknowledged successes and ways of helping the Lake District, often at times seemed to value land more than people, to look down on traditional ways of raising food. He reminds us that “when local traditional farming systems disappear, communities become more and more reliant upon industrial commodity food products being transported long distances [. . .] They begin to lose the traditional skills that made those places habitable in the first place, making them vulnerable in a future that may not be the same as the present. No one who works in this landscape romanticizes wilderness” (218). My reservations about this book are eclipsed by its positive aspects, but I would note that the style, though excellent when it comes to description, was not wholly to my taste; there is a tendency toward repetition that is at times awkward, and the inconsistent tenses were a bit maddening, making some parts of the work sound like strung-together blog posts. And it is a book very much about men (fathers and sons, and grandfathers), though women (family members and other shepherds) do make appearances. I would have liked to see a fuller picture of the no doubt grueling work the author’s mother, wife, and grandmother put into running the farm. Particularly troubling here are two or three passages in the middle of the book that seem to belittle the author’s grandmother’s concerns and experiences. These reservations aside, The Shepherd’s Life is a fascinating book, and well worth reading. Recommended. If you’re looking for more on sheep farming, you might look at Evie Wyld’s novel All the Birds, Singing, or, for a very different take, Sir Thomas More’s Utopia. For a perspective on modernity that I suspect Mr. Rebanks would find congenial, and because there’s no opportunity I won’t take to recommend it, you might consider picking up The Lord of the Rings. I loved All the Birds, Singing, which also depicted the difficulty of that life. This is very, very different; a fascinating counterpoint. Hello. I think I would enjoy reading this book. (And quiet cheers for non-fiction!) Thank you for an interesting review. I love the quote from page 179! I feel like this all the time, even though I live a fairly quiet life. When I am away at my favourite camping spot, I feel like I never want to come back. It sounds like a nice book.